The argument brought against the ‘Roman pronunciation’ of Latin is twofold: the impossibility of perfect theoretical knowledge, and the difficulty of practical attainment. If to know the main features of the classic pronunciation of Latin were impossible, then our obvious course would be to refuse the attempt; to regard the language as in reality dead, and to make no pretence of reading it. This is in fact what the English scholars generally do. But if we may know substantially the sounds of the tongue in which Cicero spoke and Horace sung, shall we give up the delights of the melody and the rhythm and content ourselves with the thought form? Poetry especially does not exist apart from sound; sense alone will not constitute it, nor even sense and form without sound. But if it is true that the task of practical acquisition is, if not impossible, extremely difficult, ‘the work of a lifetime,’ as the objectors say, do the results justify the expenditure of time and labor? The position of the English-speaking peoples is not the same in this as that of Europeans. Europeans have not the same necessity to urge them to the ‘Roman pronunciation.’ Their own languages represent the Latin more or less adequately, in vowel sounds, in accent, and even, to some extent, in quantity; so that with them, all is not lost if they translate the sounds into their own tongues; while with us, nothing is left—sound, accent, quantity, all is gone; none of these is reproduced, or even suggested, in English. 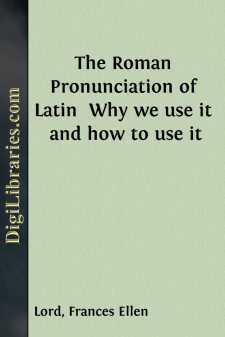 We believe a great part of our difficulty, in this country, lies in the fact that so few of those who study and teach Latin really know what the ‘Roman pronunciation’ is, or how to use it. Inquiries are constantly being made by teachers, Why is this so? What authority is there for this? What reason for that? In the hope of giving help to those who desire to know the Why and the How this little compendium is made; in the interest of time-and-labor-saving uniformity, and in the belief that what cannot be fully known or perfectly acquired does still not prevent our perceiving, and showing in some worthy manner and to, some satisfactory degree, how, as well as what, the honey-tongued orators and divine poets of Rome spoke or sung.